t*rexes and tiaras: Tuesday Titles 124..
Tuesday again, so soon! I've been reading like a demon lately but am hardly making a dent on the to-read pile. I clearly need to spend more time on the treadmill, as it's where I do a lot of my reading.. 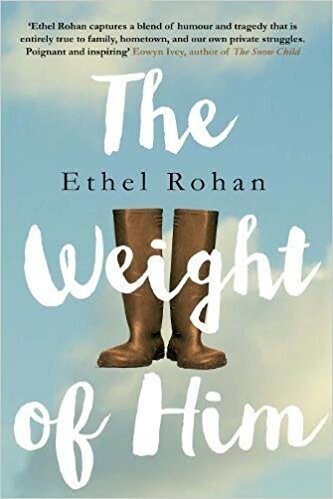 The Weight of Him is a melancholy story: Billy is dealing with the recent suicide of one of his sons. He and his wife seem to be being forced further and further away from one another in the aftermath and his professional life is taking a turn for the worse, too, with a supervisor asking some suspicious questions of him. Billy wonders what he can do - can one man, even one as big as Billy - really make a difference? He decides on a personal challenge and it's rather lovely to watch his progress. I found myself willing him to find a little more strength and succeed in a few chapters.